Not all appointments are the same. Some take only a few minutes, while others can take hours or more. 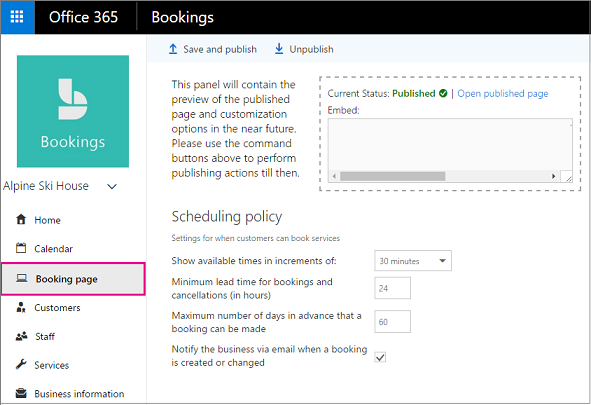 In Microsoft Bookings, the Booking page is where you set the scheduling policies for your business. Scheduling policies include the length of appointments, acceptable lead and cancellation times, and automatic notifications of booking changes. The policies you set here are the top-level policies. They are automatically applied to all the services you offer unless you choose to modify them on a per-service basis. For example, let's say that for most services, such as equipment repairs, one-day notice for cancellations is acceptable. But for those services that require facility reservations or fees, such as golf lessons, you might require three days' notice. You can set this service-level policy on the Services page. See Define your service offerings for instructions. This table explains the various scheduling policies available on the Booking page. You build your staffing plan based on the appointments that are scheduled so it's important to know in advance how many customers are coming in for service on any particular day. The lead time policy enables you to specify the number of hours in advance that customers should book or cancel an appointment. If you want to limit how far in advance customers can book appointments, then this is the setting for you! You can set the maximum for 365 days or more. 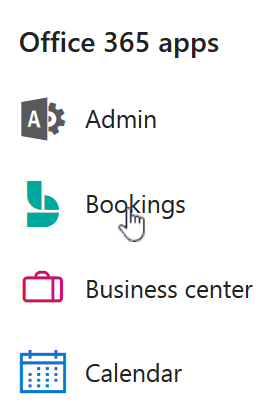 Select this option when you want to receive an email any time a customer books an appointment or changes an existing one. The email will go to the mailbox specified on the Business information page. See Enter your business information for details. When you're ready to publish your booking page, select Save and publish. See Publish or unpublish the booking page for more information.